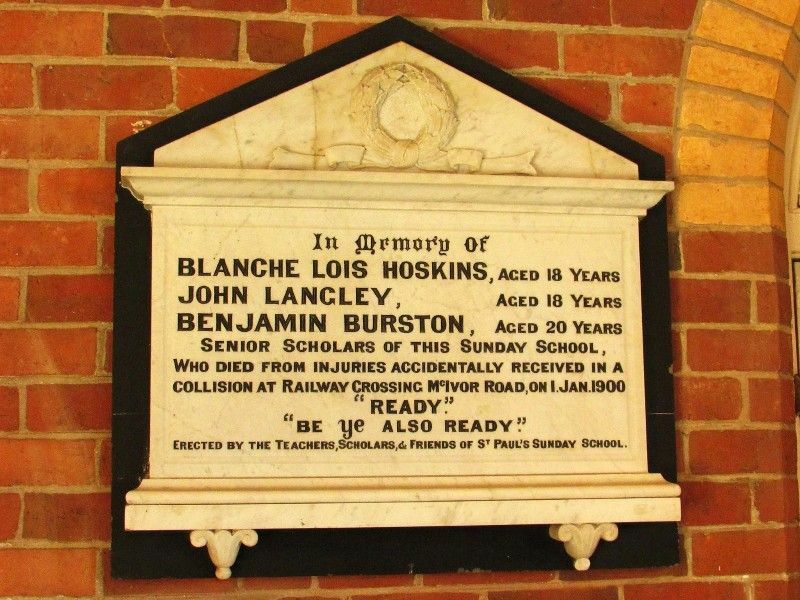 Marble tablet erected by teachers, scholars and friends of St Paul`s Sunday School in memory of senior scholars Blanche Lois Hoskins, John Langley and Benjamin Burston who died from injuries received in a collision with a train in January 1900. A very shocking accident happened at the Mclvor-road crossing, four miles from Bendigo on the Wallan line, on New Year's day, a picnic party in a cab being run into by an excursion train running to Axedale. There were eleven young people, between 16 and 20 years of age in the cab. The driver, James Brown, states that when crossing the Heathcote line at a point four miles from Bendigo, he suddenly heard a whistle, and saw a train within 20 yards of him. Then came the impact, and he was thrown to the ground. The horses were carried along the line while the cab was turned right round. A boy and girl in the front of the cab were injured, but several inside were much hurt. Dr. Bassett who was in the excursion train, attended to the injured, who were sent back in the train to Bendigo, and thence conveyed to the hospital. John Langley was crushed about the head and chest, and has since expired. Benjamin Burston, son of the head teacher at Gravel Hill has had his arm amputated at the elbow, and is in a very weak and low state from shock. Blanche Hoskins, daughter of Councillor Hoskins, is suffering from concussion of the brain, and is in a low state. Maurice Fogerty has a severe wound in the face. Fred Wicheby has his left arm broken, but has been able to leave the hospital. Albury Banner and Wodonga Express (NSW ), 5 January 1900. Melbourne January 2. Miss Blanche Hoskins, who was seriously injured in the railway accident near Bendigo yesterday, died today, making the third death. The other sufferers are progressing favourably. An inquest on the bodies of John Langley and Benjamin Burston was opened this morning at Bendigo. The bodies were identified, and a visit of inspection was paid to the scene of the accident. 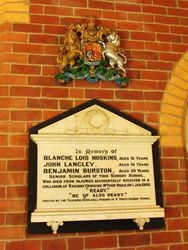 Langley was eighteen years of age, and the son of a well known grocer. Burston, aged eighteen, was a jeweller by trade. Miss Hoskins, aged eighteen, was the daughter of an ex-Mayor of Bendigo. South Australian Register (Adelaide), 3 January 1900. 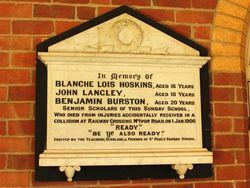 A large congregation assembled at St Paul's Church on Tuesday night, when Archdeacon MacCullagh unveiled a tablet in memory of Blanche Lois Hoskins, Benjamin Burston, and John Langley, the victims of the New Year's Day railway fatality. Archdeacon MacCullagh referred at some length to the circumstances surrounding the calamity in terms of regret and sorrow, and a special service was held in connection with the ceremony. The Argus (Melbourne), 20 June 1900. Erected By The Teachers, Scholars & Friends of St. Paul`s Sunday School.